Photo of Shirley Temple from the Shirley Temple’s Storybook episode “The Princess and the Goblins”. I am interested to see File 770 is not the only sf/fantasy news outlet to pass on reporting Shirley Temple Black’s death this week. As of this writing, Locus, Ansible and SF Site News have had nothing to say about it either. I wonder what readers of SF Site News and File 770, in particular, think about this omission? Our two sites habitually jump to report the passing of far more obscure Hollywood types who once worked on a $200,000 horror movie or had bit parts in genre TV shows. Shirley Temple movies were rich in fantasy in the psychological sense, some even had dream scenes and exotic costumes, but they didn’t contain fantasy elements like witches, wizards, dwarves, supernatural magic and the like. Her studio refused to loan out the child actress to make The Wizard of Oz. She never made a signature fantasy film of her own. However, as an adult she hosted Shirley Temple’s Storybook (1958-1961), and Random House published four collections of fairy stories branded with her name. I watched those shows as a kid! And when did I ever need any more excuse than that to mention someone? I confess there’s no rocket science involved in File 770’s editorial decisions about whose obituaries are run. This entry was posted in Editorial Notes, In Passing by Mike Glyer. Bookmark the permalink. My guess is that they didn’t mention her passing because she was a Republican, and most speculative fiction aficionados are liberals – and petty, spiteful liberals, at that. It’s interesting to note that Temple actually acted in some of those fairytale adaptations! I would have passed on Shirley Temple myself, back when Victoria and I were publishing DNQ. Also on Sid Caesar. Everyone loved Lincoln too, but his obituary woudn’t have belonged in a contemporary SteamPunk-dimension newsletter, I don’t think. However, F770 is your blog, so if the only connection you can draw between Shirley Temple and SF is that you played with a toy water-pump rocket when you were eleven, on the same day you watched “Little Miss Marker” on TV , I have no real problem with it. I hope, however, you will skip any temptation to note the passing of Michael Jordan, just because he was in a terrible movie called Space Jam. I wrote an obit for Shirley Temple and it will be included in my annual round-up next year, but I felt that her fairy tale series didn’t quite reach the level to include. I’ve begun to cut back on some of people who have minor film credits for inclusion on the daily updated site (but still include them in the annual review), but I don’t have any hard and fast rule (see, for instance, my inclusion of Sid Caesar). Actress Shirley Temple Black (b. Shirley Temple, 1928). Died on February 10. A prodigious child star, Temple Black produced and starred in Shirley Temple’s Storybook, which recreated classic fairy tales, as well as the 1937 musical Ali Baba Goes to Town and The Blue Bird. Some of her most famous work includes Heidi, The Little Princess, and Curly Top. She won a special Academy Award in 1935 and was appointed Ambassador to the UN, Ghana, and Czechoslovakia. Foolish earthlings.”Space jam” is actually quite good on space toast. @Dave: Right you are — “none so blind” strikes again, even though I combed through her filmography before deciding against running an official obit. The Blue Bird not only is a fantasy (one I’ve seen on the stage), it was actually touted as an answer to The Wizard of Oz. Good thing you’re the one writing for SFE. @Steve: Thanks for previewing your obit. I noticed Ali Baba Goes To Town too, but the articles about it indicate it was an Eddie Cantor movie in which Shirley Temple just plays herself in a scene at a movie premiere. So the movie is a fantasy (an extended dream sequence), but that’s why it didn’t tilt me in the direction of treating hers as a “genre” death. “My guess is that they didn’t mention her passing because she was a Republican, and most speculative fiction aficionados are liberals – and petty, spiteful liberals, at that. Mr. Dobbins: I have met more than enough conservative and libertarian science fiction fans to be able to state flatly that from my particular point of view your statement is false, both in the first and second parts. I don’t doubt that Mileages Vary, but the points from which you and I view fandom are greatly dissimilar. 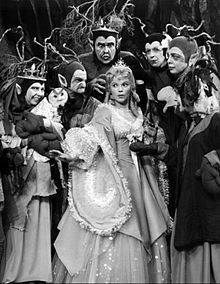 Shirley Temple’s Storybook adapted many works of fantasy and that alone should qualify her for mention in fannish sites. If you were a kid, back in the day, you were watching them. If she had only appeared in The Blue Bird, that might have not been enough for some, but the Storybook puts it way over the line.